This week I've actutally been at the bench and am making some progress. What do you do when you have a canopy masking phobia? You build a UAV. This is the new SkunkModels Workshop MQ-9 Reaper. It will carry RAF markings. Hope I added enough nose weight. So far so good. Hope progress from here with be swift but sure. Another highlight was a RAF Hawk T.2 which was part of BAE's sales pitch to sell the Hawk to the USAF as a T-38 replacement. I got a chance to fly the Hawk simulator as well which was kinda fun. Sadly due to paperwork issues the Hawk could not fly in the show as planned. The F-16 flew an impressive display in the show. A UAV with pilot's and crew chief's names on it? Aerobatics in a Beech 18? Yes indeed and pretty amazing. The CAF's ex-Royal Canadian Navy TBM was on static display. This T-28C did an aerobatic routine complete with wing tip smoke. Saturday I attended the Holloman AFB Air Show. Here are a few pictures of the event. Another highlight were the Holloman based German Air Force Tornados. It was nice to be treated to a four ship flypast during the show including a air to air refueling demo. It was interesting to note only one Luftwaffe Tornado had gone grey. While the rest of the aircraft were still green. Here is the tanker bird. The Holloman badge incorporates the New Mexico flag. The static display Tornado was all loaded up with weapons. Here is something you don't see much in the U.S. an IRIS-T missile. Another Yellow Wings subject...someone had built the new RS Airabonita in time for the show. A very nice CMK Seafire. Shows just what can be done with the old Matchbox Skynight. 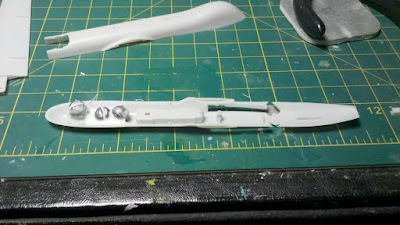 A car door Typhoon conversion from the Academy kit. Steve N.'s retro build of the old Revell B-17. Always nice to see a Hasegawa Mentor built. Mansfield's ANG unit just got their new C-27s and already someone finished a model of it. A beautiful build of the Contrail vacuform Hendon. Yesterday Rick and I made the four hour drive down to Cincinnati to attend the annual Cincinnati Scale Modelers Contest and Swap Meet. It is always a good time and again it did not disappoint. The vendor area had some good buys and I bought a few too many kits. Here are some of the highlights from the contest area. 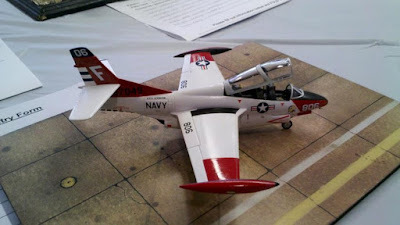 I really liked the paint job on this out of the box Airfix MiG-15. A really striking scheme on the 1/48 Hawk. A great job on the Matchbox T-2 Buckeye. A cute little Airfix 1/72 Bulldog. David Knights's AVG Hawk 81. 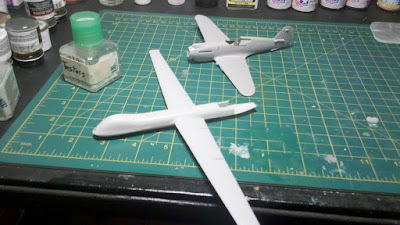 A big 1/32 Hawker Hunter. A 1/72 scale resin Bulldozer. A very neat, and large, B-52 diorama. I don't know what this is supposed to be, but it is cool. Scott King was finishing his Valom BT-1 as the show started. Even so, he managed a second in 1/72 props. Congratulations to David for his third place in 1/72 props. Even if he was lapped by a kit that was unfinished at the start of the show. Look for Part Two later in the week.